Emoji are increasingly a part of text-based communication, but they don't quite have the universality of text; whereas text would be interpreted the same way in different fonts (well, mostly, and not including ALL CAPS), the same emoji as rendered in different operating systems may be interpreted very differently. The example above is perhaps the worst: the emoji standard calls for a "grinning face with smiling eyes," but each operating system is free to design their own graphic to represent that - and that's where the trouble begins. If an Android user sends this to an Apple recipient, the sender sent something they perceive as +4.3 on the happiness scale, but the receiver gets something they perceive as -1. That's a big difference, which is just begging to cause trouble! (And I think Apple is at fault here: that's no grin, that's a grimace at best.) This was studied by the GroupLens research team at the University of Minnesota. Their results make me want to make my own grinning-with-smiling-eyes face... but Apple-style. Asinine Cross-Marketing: Cold Stone V Superman? Hey Cold Stone: all I wanted was to order a cake for my wife's birthday. I didn't want to find most of your website occupied by a trailer for a bad movie that's been out for a month. A movie, by the way, which is dark and violent and not at all ice-cream-related. I'm a little concerned that any treats I do order from you will be contaminated with Jesse Eisenberg's Lex-Luthor hair. And it's especially annoying that the web browser tab title is just "Batman V Superman" - not the tab I'd be looking for to complete my order. So let's take it easy on the cross-marketing, and just stick to making ice cream? You're pretty good at that. Apple's slimmest laptop, the Macbook, partly achieves its svelte profile by sporting only a single USB-C port. And that's great, USB-C is the future; but good design requires compatibility, in this case with the present. 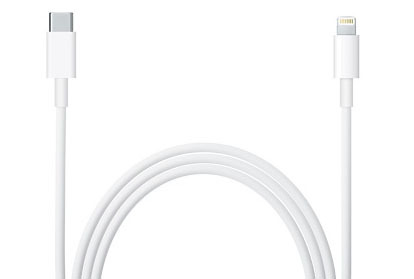 See, Apple's mobile devices uses their proprietary Lightning connector, and until just recently Apple didn't make a USB-C-to-Lightning cable. You could spend thousands of dollars on the highest-end devices from the most successful company in the world, with no way to connect them to each other except a clunky, expensive, band-aid of a dongle. They finally got around to it, but compatibility shouldn't be an afterthought.